Invoice history based on 226 reviews. Polite, friendly, professional with experience since 1987 & STA certificate. Reliable, clean, competent service with high standard of work & fair prices. All aspects of plastering, painting & decorating, dry lining, coving, artexing, arches, rendering, dashing, ceiling repair & insurance work. Building work & general repairs. We can also cover patches in render with polymer render applications. 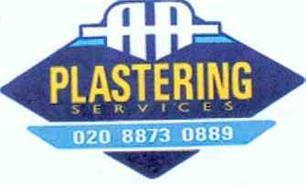 Look at our web site www.aa-plasteringservices.co.uk for more information.